Man.. I remember the 90s. Doesn’t seem that long ago. The early 90s (and 1989) was when I started playing guitar. Getting into pedals, amps, etc. It’s been a long road, littered with countless questionable gear decisions, but it’s been fun, and that’s the point right? Around 1990 or 91, I purchased my first pedal – the DOD FX75 Flanger. Back then, you saw DOD all over the place. Pedal manufacturer options were much more limited compared to today’s endless options. I remember DOD, Boss, MXR, Ibanez and EHX. But for some reason, you see a lot of those DOD pedals everywhere. I’ve been seeing a lot of chatter of DOD bringing back some of the pedals from the 90s.. which is pretty interesting. I’ve done a few pedalboard break downs of pro players, and you sometimes see some of those older DOD boxes on there, and some are greatly missed.. like the Meatbox and Gonkulator. DOD decided to bring these back in full glory. The Meatbox is a subsynth that bass players love! The Gonkulator is a ring modulator. The enclosures are different, retro, but not like their original enclosures, and with good true bypass switch. I always hated those original DOD footswitches. 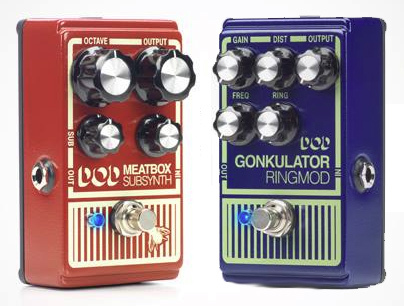 The DOD Meatbox and DOD Gonkulator will be selling for $149.95. I’m not sure about release date yet. Let me know what you think about this by commenting below! TC Electronics Polytune Tuner – Shrinks! I bought an original Meatbox over ten years ago. It was an eBay deal (under $20). I guess it's resale value just took a nosedive.